I was in a group that had climb Tryfan earlier in the day before moving on to climb Glyder Fach next door. It was November and we had decided to head down by the Y Gribin ridge as the light dimmed. Cutting cross-country to get back to the cars, we heard cries of “help!” and headed in their direction to see what we could do. We weren’t the only people who had responded to the shouts. Mountain Rescue was already on the scene and we stopped to see if our help might be needed. 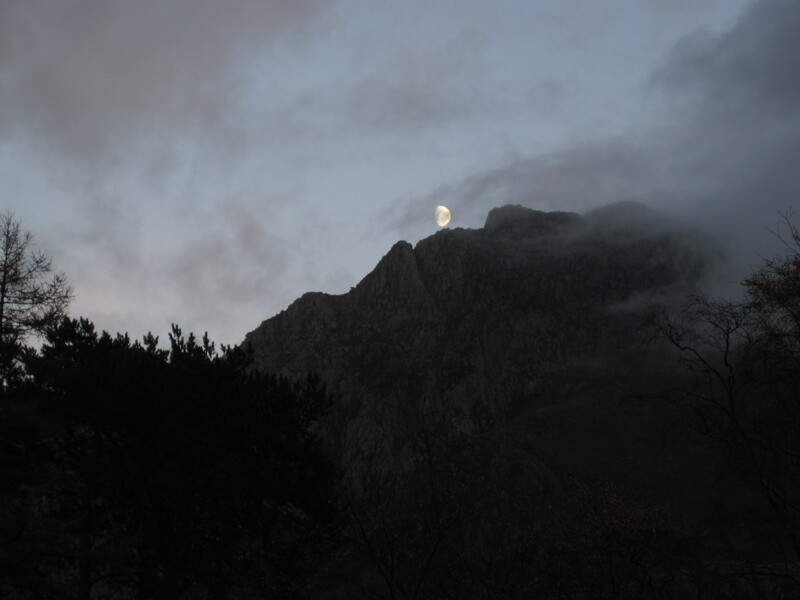 All I could see up on Tryfan’s dark face was a Mountain Rescue guy in a bright yellow jacket and the beams of a couple of torches carried by the rescue team. It was as if the people being rescued were camouflaged. After a few minutes it became clear that our assistance wasn’t needed and we carried on. This was the first thing that got me thinking about whether I would be safer in the mountains if I was more visible. The second thing was walking along the A85 at night while cars and trucks roared by. It had taken us longer to climb Ben More and Stob Binnein and get back down again than we thought it would. This left us having to walk back to the village of Crainlarich along an unlit road. Although we all had headtorches, they didn’t make me feel visible enough to feel comfortable. I remember thinking how stupid it would be to manage to climb mountains in a Scottish winter only to get killed by a car as I walked back to the hostel. Yellow, orange and red are the colours to go for if you want to be seen at a distance or in low visibility and these are the colours of most cycling jackets. Unfortunately, there is a more limited selection of mountaineering related clothing in these colours. Some of the more technical, expensive jackets available are in suitably garish colours, but a lot of clothing for the mountains is in more sombre colours. This particularly seems to apply to softshell jackets, to which manufacturers have in the past taken a Henry Ford view of colour options. The main reason why the colour selection is a bit limited is probably that most people who go into the mountains tend to wear some of their mountain clothing when walking down the street, when you might not want to wear a brilliantly coloured waterproof. I’m not knocking this small bit of vanity. I don’t want to walk around London in a bright yellow jacket. Another option is to buy a brightly coloured rucksack. I have a red rucksack that stands out nicely at a distance on a mountain. There is a fair selection of red rucksacks on the market as well as a limited selection in orange and yellow. 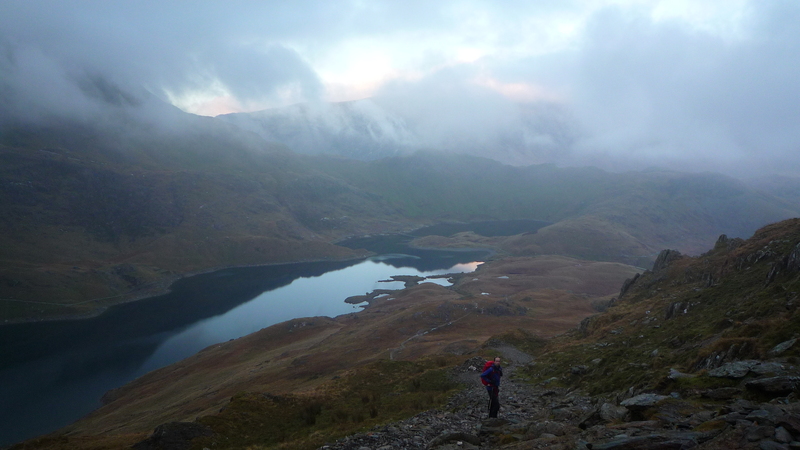 Me on the last leg of the Snowdon Horseshoe, trying to finish the walk before it gets dark. A headtorch is essential in the mountains for seeing where you are going and signalling rescuers, but they usually don’t do a much to make you visible from behind. Thankfully, the LED lights made to make cyclists visible from the sides and back are now small and lightweight enough to take when you go up a mountain. Many of them are also designed to be attached to rucksacks and/or clothing. 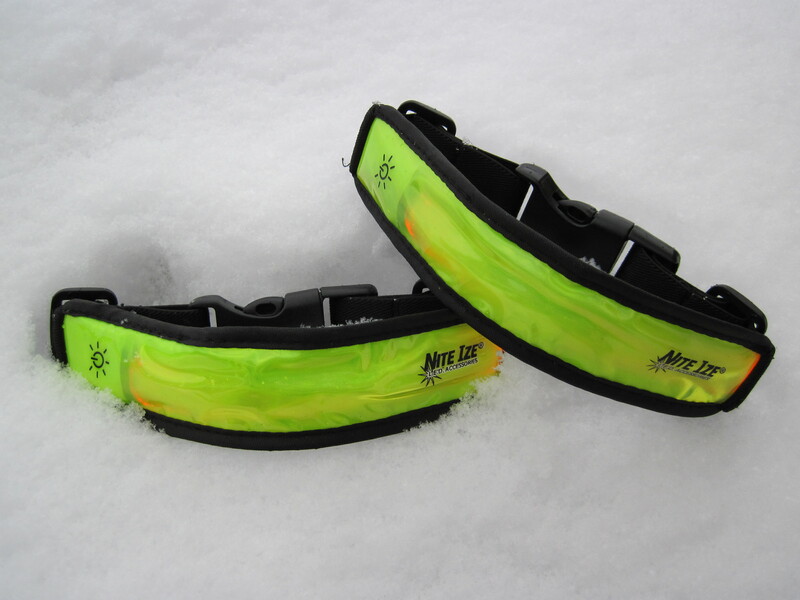 This is an example of the types of LED lights you can get for cycling and running. These can be worn on your arms or clipped to a rucksack. They have a constant light and a strobe light function. You could also look to buy a headtorch with a red, rear light such as those made by Alpkit and Mammut. Cyclists’ clothing and bags are often covered in the reflective patches and material that shines a bright white in even low levels of light from car headlights or a torch. Mountaineering equipment manufacturers have increasingly been adding reflective bits to clothing and I think this is a great trend. Unfortunately, the amount of reflective patches and material used in mountaineering gear is often quite small. What I’ve done is to buy reflective stickers from cycling shops and add them to my rucksacks. These stickers have survived all sorts of rough treatment and conditions. The only ones that are getting dog-eared are the stickers on the rucksack that I use for commuting and that I’ve washed a couple of times. Although it says on some of these stickers that they can be stuck to helmets, it’s a good idea to check the small print because the adhesives on many stickers can weaken a helmet. These are the methods I use to give me a higher chance of being found by Mountain Rescue, keeping together with a group in the mountains and not getting hit by a car on the walk-out. I feel safer for it.